A quick note before moving on to the matter at hand: there are also a few handheld ports of Nebulus for Palm OS and old Windows phones, but since I haven't been able to find the Windows phone remakes, nor do I have access to any Palm OS devices, I haven't included those versions into this comparison article. If you have any experience on those, please feel free to throw a comment. Now, at the time of starting to write this massive entry, the original versions were rated as follows... At Lemon64, the European C64 release: 8.0 from 195 votes; the American C64 release: 8.1 from 21 votes. At World of Spectrum: 8.48 from 131 votes. At LemonAmiga: 7.59 from 94 votes. At Atarimania, the unreleased beta version for the 8-bit computers was at 7.3 from 12 votes, while the ST version was deigned with a more respectable 7.7 by 36 voters (again, the American version was at 7.8 with 8 votes). 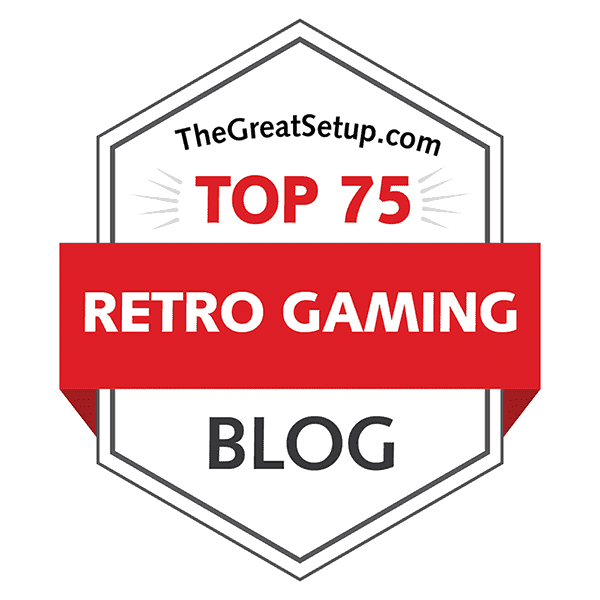 At AtariAge, the A7800 version's score was - and probably still is - averaged from 5 external reviews, rounding it at 84%. From the usual Amstrad sources, the CPC-Power score was at 16.64 from 20.00, while the review at CPC Game Reviews still has an 8 out of 10. At Abandonia, the DOS version has been given a 4.0 by the editor, while at the time, 2542 voters had averaged their votes to 2.7 out of 5. The rating of F- for the NES version at Questicle.net might be considered unfair. Last but not least, the Game Boy conversion had a 3.2 from 5 votes at MobyGames. The least, as might be expected, is the non-existant score for the Archimedes version. Now, let's get on with it. Nebulus, to be honest, is not nearly as descriptive a title as its American equivalent, Tower Toppler, is. It is a much more Hewsonesque title, though, and as such, more fitting for maintaining the mysterious nature of the game. The game's plot described in the manual offers some explanation to all the mysterious nature of the game and its title, if you're inclined to know. Nebulus, is apparently a water planet, and someone or something has been building giant towers without permission, and your job, as an employee of Destructo Inc., is to destroy all the unpermittedly built towers. The idea has been reported to come from an odd real-life occurrence that happened in John M. Phillips' own front yard. The idea is basically to walk and jump around a series of towers and plough your way all the way to the top of each tower, then level it down to the ground. Your progress is often made more troublesome by not only a throng of odd-looking moving obstacles that you may or may not shoot, but also blocks disappearing from beneath your feet. It's really just a game of trial and error for the most part, but you do need good platforming skills on your chosen controller, as well. The neat trick here that probably made Nebulus such a huge thing back then is the rotating 3D-effect of the tower you're walking around, but having a cute green pig-like protagonist called Pogo might have helped, too. Each level is separated by an underwater side-scrolling shoot'em-up section, in which you collect bonus points by shooting at fish and collecting them. At least in some versions, but we shall find more about that later on. For all the praise Nebulus inspired in its day, it has certainly had its fair share of criticism as well, and I cannot say all of it has been without reason. It's a game you either love or hate, which is basically another way of saying that it could be considered a cult classic. Worth having a go, but don't expect too much from it. By the very basics, Nebulus is an easy game to start playing. You just walk left and right around the cylindrical tower, use lifts and go up through the doorways and push the fire button to either shoot while standing still, or jump while walking. It's all the visible hazards and less visible traps that make this a particularly devious game. Getting to know all the enemies' timed attacks and the spots where the floor disappears when you walk onto them is part of what the game is all about, and as such, it should suit the sort of gamers who love playing shoot'em-ups and memorizing patterns. Even so, quick reflexes and learning the way Pogo moves around is necessary for finding any success in the game. Although it is said in the instructions, that Pogo needs to pull a switch or something to make the buildings self-destruct, the player's job is really only to find the correct doorway at the top of each tower, and Pogo will do the switch-pulling for you. Personally, I thought it was a bit shocking to find out, how similarly all these versions play. The biggest differences to be found concern the bonus game between each level, which I might as well deal with right away, since it has now been mentioned. First of all, the transition level features Pogo making the journey from one tower to the next in his trusted mini-submarine, and the idea is just to shoot at these weird squirming fishes, which will then be captured inside bubbles, and you need to pick them up to get some bonus points - or bonus time for the next level, if you're playing the AMIGA, ST or ARCHIMEDES versions. The bonus level will end when you reach a large pipe, through which Pogo will automatically steer his submarine. The most shocking discovery about the differences in the bonus round is not perhaps the fact, that it's completely missing from the SPECTRUM and AMSTRAD versions, but rather, that there is a completely different sort of a bonus round made for the NES/FAMICOM and GAME BOY versions. I don't know what it is about NINTENDO game developers, but they seem to have a tendency to unify everything as much as necessary, as if to only please the small percentage of gamers who cannot abide variety in their games. See, because the game is more of a platformer than a shooter, they had to make the bonus round into an even more basic platformer to be more consistent. To be fair, the platforming bits are probably more fun for NES and GB gamers, the most vocal of whom cannot seem to wrap their brain around this game's original brilliance. Happily for them, completing a bonus round will give you extra time for the next tower, instead of just bonus score. A large portion of this arguable inaccessibility has a lot to do with the fact that it was created for machines that have only one fire button in their usual controllers, and when doing the console translation, the second fire button toggles pause (when it really should be the Start button), so naturally, having to jump and shoot with the same button must be confusing to people who have become accustomed to having both action buttons in use. Although I can sympathize with the need for the use of both buttons, this inability to shoot and jump simultaneously is a Nebulus-specific game mechanism, that you just need to get your head around. If it weren't for that little inconvenience, it wouldn't be the same game - for better or worse. Also, I guess memorizing the traps and learning how to dodge the odd little molecule-like creatures that come from one side of the screen, slowly make their way across the screen, and finally disappear from the other end (you know, you could just use the doorways to your advantage), can be too much to bear when you can't shoot and jump simultaneously. There is an option to switch the difficulty level between "Novice" and "Hero", which doesn't help all that much, since the only thing I noticed that it had an effect on, was the general enemy movement speed. The game was originally designed to be played on the timings used in the more difficult level, so that's the one I would personally go for. Another thing entirely in the NES/FC and GB versions is a little thing of not quite getting all the specific "enemy" behaviour models quite up to scratch - meaning, if all enemy sprites don't have clear movement patterns, something is wrong. Some of the bouncing balls can sometimes jump over flashing blocks that you're supposed to shoot, and even moving further onto different platforms, or they even get stuck in the scrolling "rut" of going along with your movement and start climbing stairs, although this is a useful method of getting rid of those balls without shooting at them... but then, shooting is easier. It's not a very big difference, at least compared to the completely different bonus stages, but it's notable all the same. For all the wrong that the NINTENDO console versions have, there is something good to be found, as well. That good can, unfortunately, be found only in the Japanese versions of the game: a password system. After getting a Game Over, each of the Japanese versions give you a thankfully short password, that you can input into the Password option screen. Why ever did they not include such an option into the European and American versions, is odd, but it might have been an afterthought. Having never played the 16-bit versions before, I thought it was absolutely shocking to find, that they have another mission (set of levels) included in them, if you ever got too good in the original levels. Honestly, I haven't bothered to play the second mission all that much, because the simple fact is, it all adds to the amount of material to play through, and when the playability is as good as it practically can be on all the 16-bits, then there's no problem. Oddly, though, the second mission was also made for the ATARI 8-BIT prototype version, but for the finished and released A7800 version, it was pulled off. Too bad the A8B prototype is unfinished and somewhat unplayable, and due to it only being a prototype, it cannot be included in the scoring bits. Speaking of the ATARI 7800 version, there's an odd feature that utilises the difficulty switches in the console. If you attempt to play the game with either player switch in "Easy" mode, you will find yourself skipping levels indefinitely, but switching them both to "Hard" mode will put things to normal. This allows you to start your game from any of the eight towers, which is an unfair advantage - something you might even call an in-built cheat mode. Of course, unless you've played the game from the beginning, you probably won't have as much of a chance getting through the final levels. At least the A7800 version's manual mentions this oddity, but doesn't call this feature an outright cheat mode, as it perhaps should. Otherwise, it's a very good version. The C64 version also features an in-built cheat mode, which enables you to choose a level from pressing the number keys, but it requires some actual in-game trickery to get it working, so I will let you find this information elsewhere. At this point, we only have the SPECTRUM and AMSTRAD versions to dig deeper into, which also requires me to briefly mention the C64 version as well. The SPECTRUM version can be played with the keyboard as well as a joystick, but the pre-defined keys are a bit odd, considering what's the norm on the platform (QAOP): you get two keys for each direction and fire - W and I for left, E and O for right, P and Q for up (enter door and go up on lift), L and S for down, and C and N for fire (shoot or jump when moving). You can also pause the game with ENTER, and if you want to restart, press fire during pause. The BREAK key aborts the current game. On the C64, the game can only be played with a joystick, but P pauses the game and RUN/STOP aborts. The AMSTRAD version can be played with joystick or the keyboard controls familiar to Spectrum gamers: Q, A, O, P and SPACE. Additionally, ESC pauses the game, and CLR aborts the game when paused. The options in the title screen are toggled with number keys 1 to 4 in the AMSTRAD and SPECTRUM versions, and the four Funtion keys on C64. The only thing left unmentioned still is the speed at which each of the three usual contestants is played. And this here really is an interesting bit of information, because the technical data is shown clearly in the manuals for each version. According to the manuals, in the C64, SPECTRUM, AMIGA and ATARI ST versions, you get "rotational" 3D scrolling with precise hidden-surface removal running at 25 frames per second, and multi-layer parallax scrolling on underwater levels at 50 frames per second (obviously in the C64 version only). The AMSTRAD manual says the scrolling speed is at 17 frames per second. To be fair, the scrolling speed might be very much the same in most other versions, but the other versions don't seem to have it documented, so we can only assume and judge by our own eyes. I'd say, that at least the 8-bit ATARI prototype runs slower - perhaps around the same speed as the AMSTRAD version, which would mean that it had not been completely optimized at that point. If I have understood correctly, the ENTERPRISE 128 can run both Spectrum and Amstrad versions, but there is a slightly enhanced unofficial conversion around based on the CPC version, which makes use of the machine's own peculiarities, and is able to run at higher speeds than the official CPC version. As I said earlier, all the versions of Nebulus, Tower Toppler and even Castelian are surprisingly similar, apart from the bonus areas. That, indeed, is the primary reason for bringing these versions to an order. Obviously, the 16-bit versions have more to play, so they have an admittedly unfair advantage there. And slightly regrettably, only the AMSTRAD version runs at a considerably slower framerate, making it notably less pleasurable to play. However, in terms of basic gameplay, it's pretty clear, that the NINTENDO variations are the least like the original, and while that doesn't exactly make them that much less playable, they will fall down to the last two places - but not in their usual manner, because of what the Japanese versions offer. Nebulus has its very own style, which hadn't been dared to emulate until well after emulation came along and remakes of old games started appearing. Part of it was obviously, because in those days, originality was something to be admired and leave untouched for as long as possible, if possible. Making a game with such unique style in graphics, the style which was even an impressive feat to accomplish, remained the sole representative of this particular genre for quite a while. And you would get a nice two-legged pig-like creature to play as. Loading screens. Top row, left to right: Amstrad CPC, Commodore 64 (EU), Commodore 64 (US), Acorn Archimedes. Bottom row, left to right: DOS (EU), DOS (US), Commodore Amiga/Atari ST, ZX Spectrum. Pogo is an odd character, to be sure. In the original Hewson cover art, he has the mixed look of a pig and a frog, who has a punkish mohawk-like hair covering his head. I'm not very sure about the U.S. Gold cover art, but if you want to analyse it, it's above in the Description & Review section of this entry. Most of the loading screens are based on the cover art, with only the ACORN ARCHIMEDES and C64 NTSC disk versions having different loading screens, representing their respective publishing companies instead of the game. The C64 loading screen looks rather horrible, I'm sorry to say. It's mostly a few shades of blue, with a splash of black here and there, and the background colour is light green. You can only barely see it's based on the cover art, and Pogo isn't very recognizable from inside his submarine. Definitely my least favourite of the proper loading screens. The AMSTRAD version is, by contrast, perhaps too colourful, with even the towers in the background, each in different colours; and this Pogo, while certainly noticable, looks more like the little sprite in the game, rather than the cover art version of Pogo. Similarly to the AMSTRAD version, the DOS loader features the in-game version of Pogo inside his sub, but otherwise, the overall look of the screen is very neat, and has a nice angle to it. The SPECTRUM loader has all the graphics it needs, but the mess of pixels that the water surface makes is a bit painful to look at. Still, considerably better than the C64 loader. And then we have the AMIGA and ATARI ST loaders, which are exactly the same, and in which everything looks as perfect as you would ever wish to, when comparing it to the cover art. Most of the title screens. Top row, left to right: Commodore 64, Amstrad CPC, DOS (EU), DOS (US). In most cases, the title screen is what you'd call a basic title screen. You get the title logo, the credits and copyrights, maybe even the score panel - you know, the usual stuff. The NES/FAMICOM and GAME BOY versions feature exclusive, almost full-screen title pictures instead, and as you can already see from below, the Japanese versions of the game feature some sort of a parrot-like thing as the protagonist. The DOS, AMIGA, ATARI ST and ARCHIMEDES versions show the game's logo, as seen in the cover art, while the C64, SPECTRUM, AMSTRAD and 8-bit ATARI versions have a different, sort of metallic look to the logo, regardless of whether it says Nebulus or Tower Toppler in it. The logos featured in all the NINTENDO machine conversions have their very own specific look about them, and feel completely off from the original feel. The most interesting thing about the title screen, that I can think of saying, is how the number of players is shown in the AMIGA, ST and ACORN versions: there are two pedestals, on top of which the selected number of Pogo sprites are spinning around. All the other versions go simply by text. Nintendo titles and options. Top row: NES and Game Boy - EU/US versions. Bottom row: Japanese versions. As you might have noticed, the game options are shown in the title screens for the most part, but in the NES/FAMICOM versions, the options screen is summoned by pressing the Select button. The GAME BOY versions have their options shown below the title picture when you summon it up, but the only options concern music and sound effects. Well, more graphics is more graphics, even if it's very little. The only new thing worth mentioning in the NES/FC options screen is the animated starfield in the background. Nothing spectacular, but it's something different. Entering a level. Top row, left to right: Commodore 64, Amstrad CPC, ZX Spectrum, DOS EGA. Bottom row: Atari 7800, Atari XE proto, Amiga/ST/Archimedes, NES/FC (middle), Game Boy (bottom). Because we want to be thorough, and because there are notable differences everywhere, here's a comparison of the "Get Ready" screens. Nebulus brings a nice change to the usual style, and introduces each tower by their names. For example, level 1 is called the Tower of Eyes, and level 2 is called Realm of the Robots, etcetera. The main difference, of course, is the font. The NINTENDO versions differ from the rest by having nothing else on the screen while the "Entering level" text appears, but I have to admit, the font used here by the GAME BOY version succeeds in fishing for some sympathy points. The more interesting difference, though, is that the graph of towers to be destroyed in the C64 and ATARI 7800/XE versions is only featured in those versions, which to me, has always been one of the neatest additions to this otherwise too traditional "Get Ready" screen. Level 1 screens from the 8-bits. Top row, left to right: Commodore 64, Amstrad CPC, ZX Spectrum, Atari 7800. Bottom row: NES, Famicom, Game Boy EU/US and J, Atari XE proto. This massive picture right here shows us, at least in most cases, both the beginning and the end of the first level from all the 8-bit versions. Apart from the NES/FAMICOM version, there's really only a flat top in each tower, so there's nothing much of interest to see in other versions. I would hazard a guess, that the lack of detail made for the original towers, and for most other 8-bits, is a valiant attempt at saving some much needed memory for all the other particulars. It is a bit unfortunate, but rather a missing tower top than a missing something much more useful, like the 3D-rotational scrolling speed. Of course, the NES/FC has the advantage of a cartridge, as well as a machine dedicated for running only what's on the cartridge, so it has that little ornamentation, as well as proper 3D-rotational scrolling speed. What the NES/FC version lacks, though, is a parallax-scrolling star background, and a sea that's actually coloured like water. Oddly enough, the stars are included in the GAME BOY version, but as for the sea: the NES/FC and GAME BOY versions don't even claim to take place on a water planet, so the animation of your arrival to each tower with your submarine has been taken away. As are the underwater segments, as you already know, but more on that later on. The starry backgrounds are also missing from both 8-bit ATARI versions. Commodore Amiga/Atari ST, Acorn Archimedes, DOS EGA. Regarding the 16-bits, let's get one thing out of the way right away: the ATARI ST and COMMODORE AMIGA versions look exactly the same, so there is no need to compare the two. Oddly, though, the ACORN ARCHIMEDES version differs notably from the previous two, if not drastically. Some might even say, that it looks better, because I've noticed that the fading sunlight background is a fairly acquired taste. I don't really mind it, but I understand the opinion, since none of the other versions have it, so it looks very much out of place. Technically, though, the AMIGA/ST look is more impressive, as it uses hundreds of more colours than the ARCHIMEDES version. The odd flashing sphere at the top of each tower is another odd thing to behold, but suits the already otherwise odd 16-bit style. The DOS version is... difficult to talk about. With an EGA palette, it looks at first like you would expect from an EGA game, but it's not quite so. At least the first level looks more like a CGA screen, but with one or two more colours in use. While the overall look feels to be somewhere in the vicinity of the SPECTRUM and ATARI 7800 versions more than the other 16-bits, the use of the relatively small number of colours and the hi-res detailing is surprisingly pleasing. Still, it seems to be more at home with the other 8-bits, which isn't much of a surprise, really. Screenshots from the bonus levels. Top row, left to right: Commodore 64, Atari 7800, Atari XE proto, DOS EGA. Bottom row: Commodore Amiga/Atari ST, Acorn Archimedes, Game Boy, NES, Famicom. So, here's the so-called juicy bit. As you have learned by now, the SPECTRUM and AMSTRAD versions feature no bonus levels whatsoever, and the NINTENDO consoles and handhelds feature a very differently styled series of bonus levels. Basically, what you get on those is more platforming in a screen that can only scroll from right to left, and at the other end of the course is the tower you need to reach in order to get the much needed time bonus. On the NES/FC, the background towers seem to show the colour of the tower you just completed, apart from the very first one, while in the GAME BOY versions, everything is greyscale. Also something that might interest you, is that each bonus level adds a variable in level design, such as disappearing platforms. The original versions, and the ones modeled after them, have an underwater, horizontally scrolling shoot'em-up section, that differs between each level in no other way, than the colour of the tower you reach at the end. The fishes' appearance in all versions is fairly similar, in that they squirm around in circular shapes, but in the C64 and ATARI 8-BIT (proto) versions, the fishes are monochrome hi-res sprites, while all the other versions that feature this bonus level have multicolour sprites. Another very notable thing is the use of colour gradients to simulate the vastness of the sea, which makes the ARCHIMEDES version look like you're flying your submarine above ground against a dark sky, shooting flying fishes. The AMIGA/ST gradient isn't much better, though, because even though it offers a huge number of colours for the gradient, there is no form in the sea. Oddly enough, the DOS version looks the most realistic in many ways - perhaps particularly concerning the bottom of the sea with its random debris, instead of seemingly patterned elements. Pogo's trusty mini-submarine has a fairly comical look in all versions, but only the DOS version uses a more rounded form for the submarine, and it has less - or at least much smaller details than the other submarines. The submarine model number differs between the principal versions: the C64 submarine is JP1, the 8-bit ATARI submarine is BA1, and the AMIGA/ST/ARCHIMEDES submarine has the initials JMP. The ATARI submarines differ from the others in colour, as well: the A7800 version has a purple submarine, and the A8B proto submarine is light blue or grey, depending on whether you're looking at it in a tower screen or in an underwater segment. Level 2 from the 8-bits. Top row, left to right: Commodore 64, Amstrad CPC, ZX Spectrum. Bottom row: Atari 7800, NES/Famicom, Game Boy. From now on, the only real new things that will appear in each level are the enemy robots that each tower inhabits. The odd drone thing that passes through the screen on the exact level you happen to be at when it appears, looks very much the same in every tower - perhaps its colour changes, but that's about it for its variety. And of course, each tower is coloured differently, but that's obvious. Now is as good a time as any to talk about the info panels, which consist of both players' scores, the number of lives, the timer in the middle, and some sort of an indicator to point out, which player's turn is it, if you happen to be playing a two-player game. The C64 and A7800 versions (and the left-out monochrome A8B prototype version of the finished A7800 version) are made from the same mold, with only slight differences between the used fonts, and the C64 version uses more colour - five different colours versus A7800's three. The AMSTRAD and SPECTRUM versions wear a notably less stylized look, having smaller font size overall, a less visible player indicator and a completely unstylized timer. From the two, the AMSTRAD version's info panel is the more interesting one, due to having unique colour shading in everything but the timer. The NES/FC version has the info panel uniquely at the bottom of the screen, instead of the top; it has everything indicated clearer than necessary, and a new feature is to show, which tower you are currently attempting to conquer. This new feature was also used in the GAME BOY versions, and the tower icon differs between the NES and FAMICOM versions. Level 2 from the 16-bits, left to right: Commodore Amiga/Atari ST, Acorn Archimedes, DOS EGA. I'm a bit ashamed to admit, that I had to play up to the third level to notice, that there are actually some actual background graphics at the bottom of each tower in the 16-bit versions - apart from the DOS version, that is - in addition to the colour-gradient skies and the sea. And the background graphics change for each level, too. The problem with these background graphics is, that they seem to conflict with the backstory of the game, which sets this all up on a water planet. Then again, John Phillips himself is responsible for the graphics, so his design can either be criticized for not being consistent, or you can consider the concept of a "water planet" to being interpreted rather freely in the case of the 16-bit versions. Whichever the case, more graphics is still more graphics, and if it doesn't interfere with the overall mood, then you might as well take it as a bonus. The info panels on most of the 16-bits look similar to each other: a green solid-ish panel with each player's info set to left and right side into a black slot, and the timer is a neat little counter, which rolls each number according to the time's passing. The ARCHIMEDES version also features a black zig-zagging line going across the entire info panel, behind all the actual info panel elements, which can be considered a good or a bad thing. I guess it's a matter of taste. The only thing I'm not a big fan of, is the unnecessary game title and the creator tag placed on both sides of the timer. Still, all of that looks infinitely better than the DOS version's info panel, which only consists of some basic text in blue and cyan, and the lives are represented by cyan squares - similarly to the 8-bits - instead of green diamond shapes. I have to admit to being more partial towards the C64/A7800 info panel style, but the NINTENDO panels have a neat clarity about them, and the alternative timer style is very nice on the 16-bits. Bonus counter screens. Top row, left to right: Commodore 64, Amstrad CPC, ZX Spectrum, DOS EGA. Bottom row: Atari 7800, Amiga/ST/Archimedes, NES/Famicom, Game Boy. Okay, this is a bit unnecessary, since the bonus counter screens only contain text, but it's a breather. 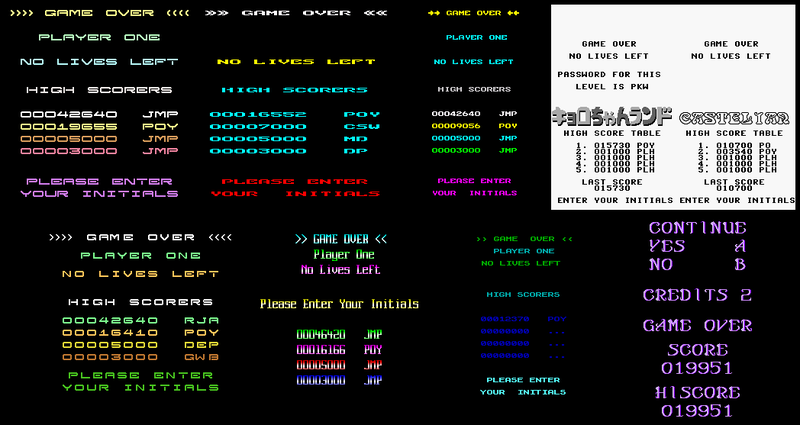 The main point in including this comparison picture is to show you, firstly, how the "main" 16-bit versions go with the title screen variation - not showing how the bonus score adds up to your actual score; and secondly, how differently the NES/FC bonus scoring screen is built up from all the rest of the game's versions. Also, rather blandly, the DOS screen only uses three shades of blue on a black background, which is no better from the NES/FC and GAME BOY versions, really. Screenshots from level 3. Top row, left to right: Commodore 64, Amstrad CPC, ZX Spectrum, DOS EGA. Middle left: Amiga/ST. Middle right: Acorn Archimedes. Bottom row: Atari 7800, NES/Famicom, Game Boy, Atari XE proto. We will only go as far as level 3, because I'm running out of things to talk about, and right now, we're reaching perhaps the most important aspects of the graphics comparison. One thing worth noting is the vertical size of the action screen, and to a considerably lesser extent, the horizontal. For the tower width, I noticed two variants: the original width, which is used by the C64, AMIGA, ST, ARCHIMEDES, A7800, A8B proto and NES/FC versions; and the narrower width, used by SPECTRUM, AMSTRAD, GAME BOY and DOS versions. In the SPECTRUM and GAME BOY versions, this is no big deal, since its more suited for each machine's natural screen size, but in the AMSTRAD and DOS versions, the amount of empty space around the tower is huge, and your field of vision by contrast is comparatively low. More importantly, having a good vertical size allows you to see some distance above you, which might help you time your lift ascendings accordingly. If we take the C64 version as ground zero, in this regard, all the rooters for the SPECTRUM, AMSTRAD and DOS versions can release your collectively held breaths, as you're just as well fitted. The 8-bit ATARI versions have slightly less field of vision, as does the GAME BOY version. Oddly enough, it's the much admonished NES version that trumps in this regard, along with the less admonished AMIGA, ST and ARCHIMEDES versions. At last, we get to the actual action graphics, and I shall start with the tower/platform colouring. On the principal 16-bit versions, the number of colours available allows the tower and the platforms to have their own tile patterns, as well as their very own colours. On the 8-bits, all the platform colours are based on what the basic colour of the tower is, for once pretty much regardless of the version. The C64, AMSTRAD, NES/FC and GAME BOY versions use some colour-based shading (for example, white/pink/purple), while the 8-bit ATARI versions go with a completely monochrome colouring for the tower and everything directly connected to it (the shading is done by black vertical lines), and the SPECTRUM version goes with a slightly different, but again, completely monochrome look, in which the chosen shading pattern allows for more subtle changes than in the ATARI versions. Oddly, though, the DOS version uses a similar style for the platforms as the SPECTRUM version, although they still have a different colour than the tower. Finally, the sprites. The original design for Pogo is deceptively pretty, because it is as simple as it is effective: a black hi-res frame over a multi-colour lo-res sprite on the C64, with just a bit of shading used for the AMIGA/ST versions, and the whole thing drawn as a single hi-res monochrome sprite on the SPECTRUM. Being a 16-bit conversion, a similar shading was used for the DOS sprite of Pogo, and the 8-bit ATARI versions went with a Speccy'ish monochrome look for the sprite. Only the NES sprite of Pogo was directly copied from the C64 version, and the peculiar-looking Kyoro-chan on the FAMICOM is no less pretty. The GAME BOY equivalents of the NES/FC sprites are singularly greyscale, yet shaded to look more advanced than the hardware should perhaps allow. It's only really the AMSTRAD version, that is forced to use a regular blocky multicolour sprite for Pogo, which doesn't mean it looks bad - just not as good as in every other version. 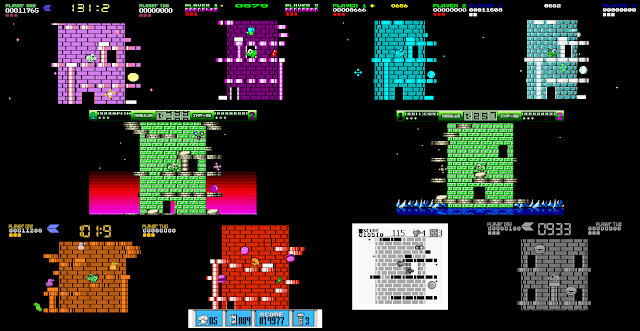 As for the enemy sprites on the 8-bits, the C64 and AMSTRAD versions use regular multicolour sprites, the SPECTRUM version obviously continues to use hi-res monochrome, much like the 8-bit ATARI prototype, but then the A7800 version uses a similar odd interlaced single-coloured style as for the tower graphics (although thankfully, in different colours), and the NES/FC and GAME BOY versions shine here by using hi-res multi-coloured (or multi-shaded) sprites. I found nothing particularly wanting in any version's animations, so in that regard, they're all equal enough, which makes finding an order of preference less troublesome. 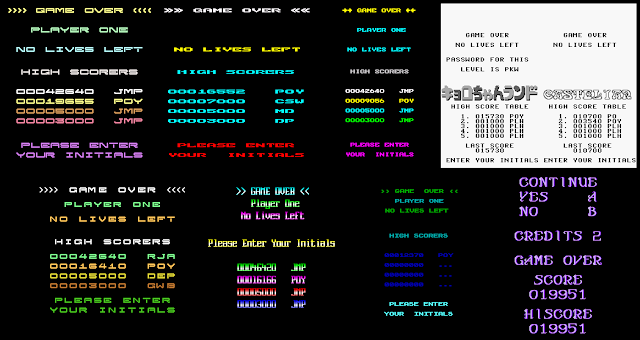 Cropped pictures of Game Over and Enter Your Name screens. Top row, left to right: Commodore 64, Amstrad CPC, ZX Spectrum, Game Boy. Bottom row: Atari 7800, Amiga/ST/Archimedes, DOS EGA, NES/Famicom. Again, the Game Over screen is nothing but text, and entering your name on the high scores list doesn't offer anything new, either. Just to be absolutely clear on this matter, I have deliberately removed all the info panels and other regular things that each necessary version's title screens would normally have, because only the above material is important. The only material differences concern the NES/FC and GAME BOY versions, none of which are directly based on the title screens. The NES and FAMICOM versions don't have high score tables, but instead the highest score of the session is displayed, and the message colour is dependent on which tower you died at. Obviously, in the Japanese versions, you also get the most recent level's passcode to be shown on the Game Over screen, and the game logo shown in the High Score tables in the GAME BOY versions is regional. DOS graphic modes. Top row: CGA. Bottom row: EGA. Something you might wish to know about the DOS version is, that the North American release (Tower Toppler) also features CGA and Tandy modes, while the European version only features the EGA mode. The Tandy mode affects the graphics in no notable manner, apart from some shading in Pogo's eyes and a slight addition of colour to the sea. I haven't been able to find the said U.S. release yet, but I do have one CGA-only version of Tower Toppler and one EGA-only version of Nebulus. 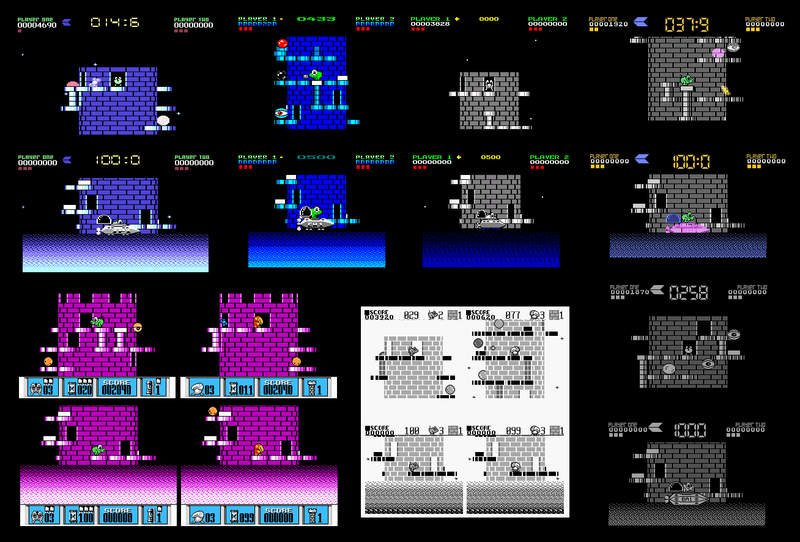 The differences, as you can see above, are rather surprising: the level-entrance screens have similar tower graphs as the C64 and ATARI 8-BIT versions, and the info panel has more colour than in the EGA version. By contrast, there's only 3 colours + black in the CGA mode, while the EGA mode uses 10 colours + black, even though it doesn't really look like it would. I guess you might be better off with the Tandy mode, if you somehow managed to get your hands on it, but unfortunately, I can't help you with that. Describing the overall feel in Nebulus' soundtrack has never been easy, at least for me, but I shall focus on the C64 version first, because it's the one I'm the most familiar with, and see how the others compare to it. You get a cautiously rocking theme tune playing in the title screen, with a melody that doesn't really seem to have a real point of focus in its progression, and it loops after just about one full minute, but it's still a tune that will stick to your head fairly easily. In the C64 version, at least, there are no more actual tunes than that. Only the "Get Ready" bits have an oddly eastern style upwards going melody of five notes, and a similar one going downwards for "Game Over". The rest of it is just sound effects. But what a library of sound effects it is. Already the quick segment of entering a level gets you through four different sound effects for the submarine's actions alone, and in between those effects, you hear Pogo stepping onto the lowest platform. Pogo's walking is as cute and quick (tap-tap-tap) as the sprite itself, and you also hear a different sort of walking noise (lower and wider apart), when he goes through doorways. Even entering a doorway makes a weird blurpy sound. The jumping sound is an ascending, muted bloop sound, but there's another jumpy noise, which is played when Pogo is hit by an enemy, which is more comical. If you fall all the way down into the sea, there's a brief series of staccato white noises mixed with odd descending blips. If you step on a disappearing platform, you will hear another series of descending blips, which are sharper than those in the death sound, and with a slight delay effect for each note. Then, of course, you get a pretty basic shooting sound, some splashy explosions, some blippy noises for destroying the flashing blocks, the rubbery "boing boing" sounds of the bouncing balls, the lifts making a tick-tick noise when going up or down, the downward sweeping bleepy sound of a lift suddenly resetting itself, and possibly the most memorably, the sound of the enemies that look like molecules, which is an annoying laughter-like sound that they make when they're just about to enter the screen. And that's only for the actual tower levels. The bonus submarine shooter levels feature a static, low "boop boop" sound in the background, which I think is supposed to simulate a sonar sound or whatever. The submarine's shooting sound is different from Pogo's own shooting sound, and picking up captured fishes makes a weird, splurchy noise. So, what Nebulus might lack in terms of music on the C64, it certainly makes up for that in the amount and quality of sound effects. From the 8-bit conversions, AMSTRAD has one of the more competent competitors for the C64 version. You can listen to both music and sound effects during play, but it's really a case of quantity over quality. Not that the music and sounds aren't good for the AY-chip, but rather, that they're just not nearly as refined as the C64 equivalents. The theme tune is not quite the same as the C64 tune, but it's definitely based on it. At least the brief intro is a bit unnecessary, and the fade-out is a cheap way to end it. Most of the sound effects have been kept in, apart from the obvious omission of the bonus level sounds, but the cuteness is replaced by choppiness, and a general lack of personality and strength in sounds that would need some in order to be effective. Sure, the ability to listen to the music can be considered a bonus, but since the tune is nothing new, I don't really think it adds anything to the overall feel of the game. Unfortunately, the SPECTRUM version feels almost like the exact opposite of the AMSTRAD version, since it only offers a beeper soundtrack even on a 128k machine. The main theme tune is shortened from the C64 version, and the game goes into an attract mode after the first three segments from the tune. You do get the five-note "Get Ready" and "Game Over" bits, but having no dynamics and harmonics really harms the overall result. And as if that weren't enough, all of the sound effects are very staccato, ticking and blipping little things that don't really differ from each other enough to say, whether you've shot something or is there an enemy approaching from the other side of the screen. Really unfortunate, on the whole, particularly considering the lack of 128k enhancements. Although not quite as lacking as the SPECTRUM version, the ATARI 7800 version was still more awkward to listen to than I first expected. The machine doesn't seem capable of playing white (pseudorandom) noises and melodies simultaneously, so the main theme tune is a beepy dual-tone rendition, and naturally, you get the slight off-tuned feel on certain notes, which the 8-bit ATARI computers and consoles are famous for. As you would expect, the sound effects are no less awkward to listen to, but at least you don't have to grab onto every false note, when the sound effects are made in such a way as to make them fit into the Atari style. Still, not very recommendable. The unfinished prototype for the 8-bit ATARI computers sounds slightly better, as the off-tuned notes in the theme tune are less off-tuned, and the sound effects feel just a little bit more refined. But unfortunately, I still can't give the prototype any scores - and if I could, I would probably give it the same spot as the A7800 version. As you would expect, the NES version sounds exactly like an NES-i-fied version of the original soundtrack - up to a point. The main title theme is somewhat modified, as it has an additional melodic line, which makes certain parts of the melody a little more chaotic, but it's not too bad, all in all. The new bonus levels feature a new tune, which is a much more happy-go-lucky NES kind of a melody built around the same rhythmics as the original tune. You can choose to listen to music or sound effects, but not both simultaneously. Having the music on reveals a new gimmick: when your timer gets to the last 20 or 30 seconds, the music starts to gradually speed up, and will continue to do so up to the last seconds. However, like in the AMSTRAD version, the tune used here is the main title theme, so in that sense, there's nothing particularly new here - just a neat gimmick. The sound effects are more similar to the C64 sounds than those on the CPC, but still undeniably NES-like; however, the submarine sound effects are gone, quite obviously. Oddly, the bonus levels will play both sound effects and music simultaneously, regardless of what you have chosen in the game options screen. For the Japanese FAMICOM version, the theme tune and the bonus level tune have switched places, which almost feels logical due to the changed protagonist. Having heard the NES/FC soundtrack first from the Nintendo portion here, I thought it was rather interesting, that while the music for the GAME BOY version was basically done based on the NES/FC version, the use of effects and other tweaks for certain instruments makes the GB version a much more interesting and technically impressive than the NES/FC version. I have to admit to being rather indifferent as to which version's sound effects sound better - the NES/FC or GAME BOY, particularly since it's a close call. However, the NES/FC version's sound effects are closer to the original, so I shall have to give props for the valiant attempt there. And still, due to the GAME BOY's more impressive versions of the two tunes, they'll have to share the same spot. Moving onto the 16-bits, we have the DOS version to worry about first. For starters, it might be good to point out, that you cannot hear any music in the title screen when playing on DOSbox on a modern computer, until you reduce the emulated CPU speed to around 600 cycles. When you start hearing something, it sounds surprisingly similar to the SPECTRUM version, in that the theme tune is played with a certain effect to get some more character into the sound, than just your basic beeps - and there are even some odd snaps here and there to add some rhythmic elements. The sound effects are slightly more pronounced in the DOS version, and you get distinctive sounds for the submarine bits, Pogo's walking, going through doors, the scanning enemy appearing, jumping and using the lift - even though all of these sound effects are quite similar in their staccativeness (if that's a word) as in the SPECTRUM version. The submarine bonus levels have less distinctive sound effects, but all in all, this version just about manages to beat the SPECTRUM in its own area. Next, the ATARI ST version is a bit of a mixed bag. The main theme tune is pure AY-chip tunage, and it sounds a good notch better than the AMSTRAD version, but I'm a bit uncertain as to whether it's better than the C64 version or not. The sound quality in the theme tune is surprisingly low, as if it was sampled from the Atari itself, but that sounds a decidedly odd thing to do, so I'm a bit baffled. The "Get Ready" and "Game Over" bits are certainly sampled, and use a proper'ish eastern plucked instrument sample for playing them. Of course, once again, the sample rate is rather low. There is a new piece of music, though: a brief fanfare played when you complete a tower, which is a funny little thing worth hearing. The sound effects are very good, and verge on leaning towards a certain kind of realism over the C64 sound effects, but they also have a similar lack of strength as the AMSTRAD version. Overall, though, it's a surprisingly different aural experience from the C64 version, so I'm going to give it a tied spot. The AMIGA version has its own oddities, too. While the theme tune makes more sense with this sampled, punchier instrumentation, as well as a higher key it's played in, there is a clear lack of a harmonic element, which makes the entire theme tune feel a bit lacking. The "Get Ready" and "Tower Complete" bits are played slower, and have no real eastern-type instrument sampled for the occasion, so that's a big minus for immersion. Also, the "Game Over" tune is just a quick downwards run of some sort of a toy piano, for about three octaves, and it just feels utterly cheap. The sound effects are of course sampled, and while the watery splashes and gunshot sounds are great and there's some humour in all this, but there's an unnecessary feel of slapstick about them. Perhaps some of you will enjoy it more than the C64 or ATARI ST, but I thought it was a bit out of place. A lot of the AMIGA version's sounds are good, but to my ears, a bigger portion of them were cheap and out of place. So, samples are not always the easy way out, if you don't know what you're trying to achieve. Last, and easily the most surprisingly, the ARCHIMEDES version's soundtrack by Matt Furniss sounds more like what an AMIGA game would sound like a few years on at best. The theme tune is completely different, but it has all the things you require from a proper theme tune: a memorable melody, a rhythm that gets to your feet (and neck), and all areas from the sound map are put to good use. Although I haven't quite gotten used to this yet, I can easily say that I would rather listen to the ARCHIMEDES soundtrack for Nebulus than the original. And then, the soundtrack has more tunes: of course you get the eastern five-note ditties as you should, although they are used for the scenes when your submarine surfaces and dives back; but more importantly, the bonus level has a funky Caribbean-style upbeat tune, which makes the entire game much more light-hearted. Perhaps even still more importantly, the sound effects are all rather fitting, and have no overly stupid humour about them - and I have to make a separate mention of the clunky lift noise, which makes the entire tower structure feel more mechanic than extra-terrestrial. Whatever your personal opinion of the game is, it seems like all versions of Nebulus are pretty much equally playable, depending on your skills on using a joystick, keyboard or a joypad, of course. Although there's the slight difference of having more to play in some versions. While this is a rare occasion, particularly when there are so many versions of the game to play, it still doesn't mean all the versions are equally good, because the quality of both graphics and sounds need to be taken into account as well. Being as equal as Nebulus is in gameplay, the other areas of the comparison take a bigger role - which is a bit unfair, considering the scoring method used here at FRGCB. In addition to all those, you still have the unofficial Enterprise 128 versions, which are based on the Amstrad CPC and ZX Spectrum versions. More notably, as was mentioned earlier, the CPC version has some enhancements that makes the Enterprise version considerably more playable. Still, I'm pretty sure some Amstrad fans will lash out for calling their version ugly and some other folks will probably lash out for giving a certain other version only so many points, because there's always someone who doesn't get this scoring system. Don't worry, it's all coming to an end right now, and I think it's about time, too. 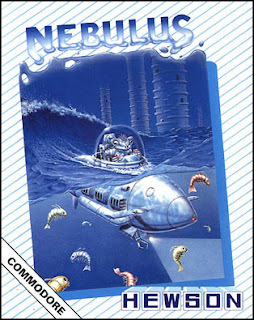 Nevertheless, I cannot wrap this up without at least mentioning the often forgotten sequel called Nebulus 2: Pogo a Gogo, which was only released for the Amiga in 1991 by 21st Century Entertainment, the company previously known as Hewson. One reason for not having had as much of a presence is probably, that John M. Phillips had nothing to do with the game, but instead was made by a team called Infernal Byte Software. Having three disks to switch through, I cannot imagine anyone actually having properly enjoyed the game, so a DOS version would have been very welcome at the time, but it did have some new puzzle-oriented ideas in it, that might make it an interesting game to check out for any Nebulus addict out there. I also have to mention a couple of remakes, just so you have some more modern options to check out. A PC remake called Nebulous (or Toppler) first appeared in 2003, and was mostly made by Andreas Röver, Bastian Salmela and Pasi Kallinen, but after numerous updates (last one from 2012), other people have joined in to get a mission editor and new missions into the remake. Another notable reworking was made for the Amstrad CPC RetroDev2015 competition by Cezar Nicolas Gonzalez (CNGSoft), who took the basic visual style of Nebulus and turned it into a more basic frog-themed platformer: Frog Alot, in which your mission is to get to your froggy girlfriend at the top of each tower through teleports, bouncy platforms and all sorts of obstacles. You also have an energy bar instead of insta-deaths, and you can refill your energy bar by picking up health pack items on your way. So, it's not a proper remake as such, but rather a different use of a similar game engine to the original Nebulus one. Good fun, though - highly recommendable. Now, it's time for me to stop thinking of things to add here, and thank you all once again for the past four and a half years. It's been a heck of a ride, and it's time for me to move on to other things. The announcement for the other things is coming up, perhaps surprisingly near in the future, so watch out for that. Also, we still have the Format Wars article coming up for RESET magazine issue #11, which we're hoping to see soon, and the article will - as usual - be also posted here, two weeks after the magazine's publication. But since this was the last comparison I'm going to make for FRGCB (for now, at least), I might as well do a double-backward somersault through a hoop while whistling Finlandia. Cheers!